This is Sekta from Branda Arabstuteri. My mother and I used to travel around studfarms on our holidays when I was younger. Mrs Töllborg at Branda was very hospitable and had prepared coffee with lots of cake and bisquits. I think my mother found the coffee more interesting than the horses... This was Sekta's last summer since she had to be put down in the autumn because of cancer. 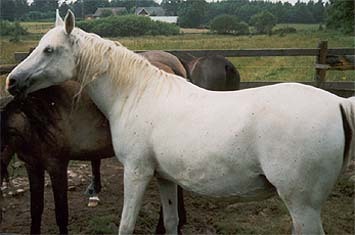 Sekta had one foal in Poland, the mare Setka by *Namiet, and was imported in foal to *Ellorus. The resulting filly Selecta was bought by Blommeröd. Sekta produced two more mares, Sarina by Ariel and Salca by Alcazar. Sekta's dam *Sabrina was also imported to Sweden and produced among others the stallion Saponiec. *Sabellina, granddam of Sekta, is known to pass on excellent racing abilities. Sekta belongs to the mare family of Mlecha OA 1845, from a Kuhailan strain. This family is well represented in Sweden although the branch *Sabellina belongs to is not great in numbers. It goes back to the mare Lysa 1915 (the other branch is through Fanfara 1914) who was the dam of three mares: Mabrucha 1928 and Safta 1929, both by Pielgrzym-Thuja, and *Iwonka III 1936 by Ibn Mahomet. Safta was the dam of Sabda 1940 by Miecznik who produced Salwa 1945 imp Sweden and Sakwa 1953 (by Abu Afas and full sister to *Sabellina). In Sweden the *Sabellina blood comes through Sekta and two more recent importations. The mare Golmohar, born in Canada and imported by Blommeröd, traces back in female line to *Sabellina through her daughter *Santa (full sister to *Sambor). The other source is indirect via the male line, the stallion Samsheik at Genberg&Co is by *Sabellina's son *Sambor by Czort.